Early-generation composite decking (including Trex Origins®, Trex Accents®, Trex Profiles®, Trex Brasilia® and Trex Contours®) first became available about 20 years ago and represented a breakthrough for low-maintenance and durability. While wood decking inevitably suffered splinters, warping and rotting, and required considerable maintenance, early-generation Trex never had to be stained and did not rot, warp or twist like wood. Periodic cleanings with a composite deck cleaner were far easier than the dreaded sanding and staining required to maintain wood decks. It was a revolutionary idea at the time. As the category evolved, this early-generation composite came in additional colors and with grain patterns that offered a more natural appearance. Even so, all early generation wood-plastic composites, whether Trex or a competitor's product, were not stain, scratch or mold-resistant, and did fade slightly in color as they naturally weathered. What did this mean for customers? If you dropped a hamburger or wine on your early-generation composite deck, the deck would stain. The color you selected initially might not be the same color you ended up with years later. And your deck would scratch if you dragged outdoor furniture across it. To address these issues, Trex introduced a new kind of high-performance decking in 2010, Trex Transcend®. 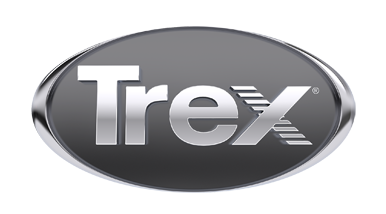 Since then, Trex has focused on additional high-performance offerings and, as of 2014, Trex no longer manufactures any early-generation composite decking. o Easier maintenance: requiring only an occasional cleaning with soap and water or a pressure washer. o Enhanced aesthetics: richer, long-lasting color palettes and natural wood-grain patterns. o A 25-year limited residential fade and stain warranty, in addition to a 25-year warranty against material defects. The development of this high-performance board made the early-generation material obsolete. Homeowners now get low-maintenance, high-performance and enduring beauty that lasts for decades.